‘Collect a Non Driveable Discovery TD5 from Immingham docks’ they said. A nice easy job so I thought. Following a conversation with DFDS everything seemed to be in place, and a time was agreed for the collection from dockside, after the ship offloaded from Norway. 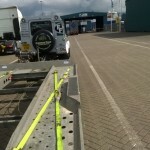 On arriving at the DFDS Nordic Gate at Immingham Docks I was very politely informed by the helpful chap on the gate that the Discovery could not be released as was being held by the “Agency” and could not clear customs as the paperwork was not complete. A slightly concerned call back to Famous Four HQ was made, asking them to speak to the relevant bodies. 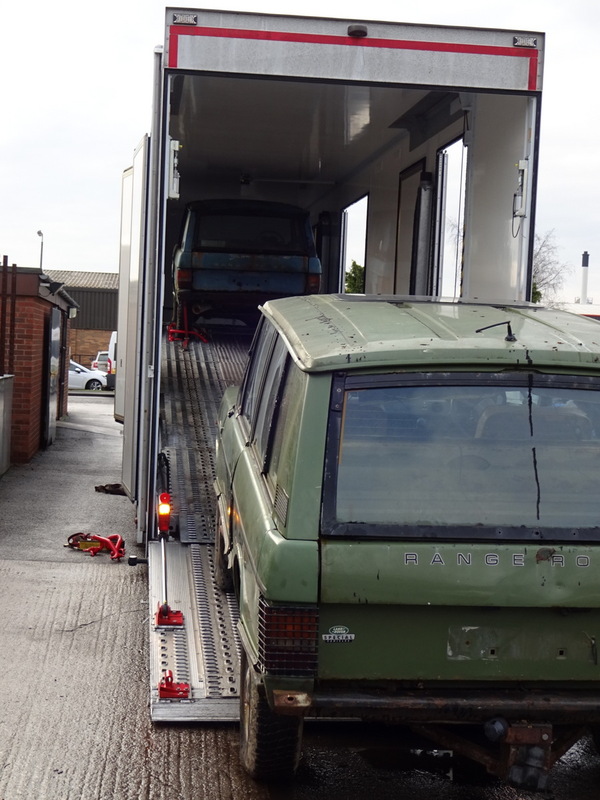 Following this call contact was established and the clearing agents assured us that customs clearance would be carried out quickly and they would ring us back. 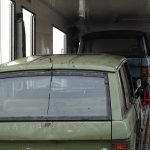 It transpired that UK customs needed an invoice from the Norwegian owner of the vehicle to Famous Four. Luckily, our admin guys had anticipated this and had one on file already. Eventually I had the go ahead to get the car from dockside. A trip back to the DFDS Nordic Gate and another 10 minutes sorting out the paperwork and I was free to collect the Discovery from Lane 11 lot number 36. As I drove down the dock lane there was the Discovery, just as I was told, in lot 36; however it was perched 6 feet up in the air on a loading skid. 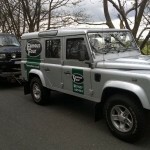 Luckily the dock lift came and lifted the Discovery to much better height, in fact perfect to just winch straight onto the trailer. Once loaded I had to then get off the docks, another 10 minutes waiting in a queue to get through the dock gates and get my release papers. 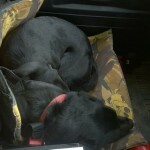 Ruby (One of our Black Labradors) came for a ride and by this time had got bored and curled up and gone to sleep on the front seat! With now finally cleared, loaded and got the correct release paperwork I was free to head back to HQ. A round journey from HQ to Docks and back that should have taken around 2.5 hours ended up being over 4 hours with the customs delay!! 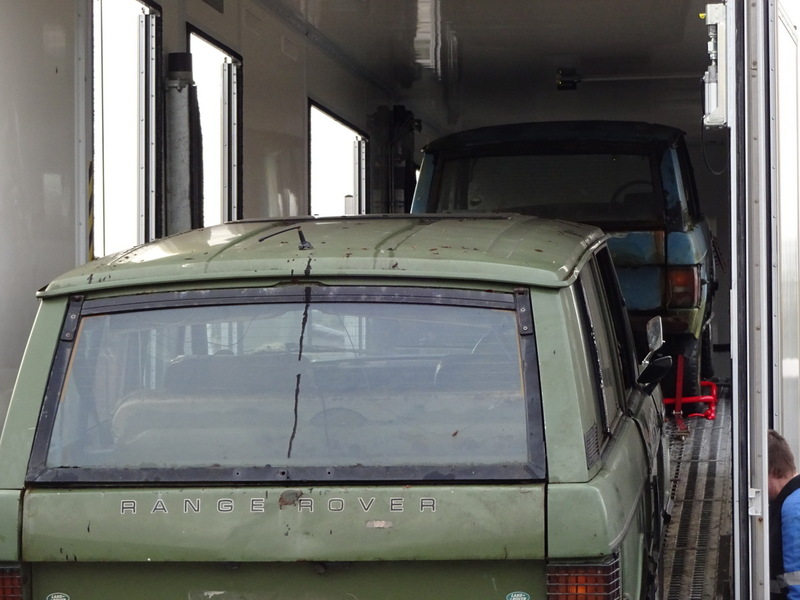 We often have visits from Norwegian and Swedish Land Rover owners club members; sometimes customers choose not to travel with their vehicles and we have collected and delivered quite a few Land Rovers, Discoverys and Range Rovers over the years at Immingham. Correct paperwork for customs is vital, and experience teaches us to anticipate problems in advance. 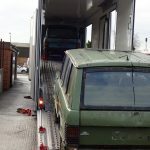 Hopefully the TD5 Discovery will be fitted with a reconditioned automatic gearbox and returned back to Norway on the next sailing. 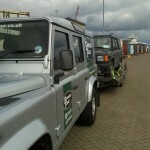 I guess this means another trip to Immingham for me, Ruby and our trusty Land Rover 110 Utility next week. For more information on Famous Four’s workshop services see our Workshop page online. Finally! The Disco is aboard!